Honored for Best Law Website at the 19th Annual Webby Awards | Hupy and Abraham, S.C. 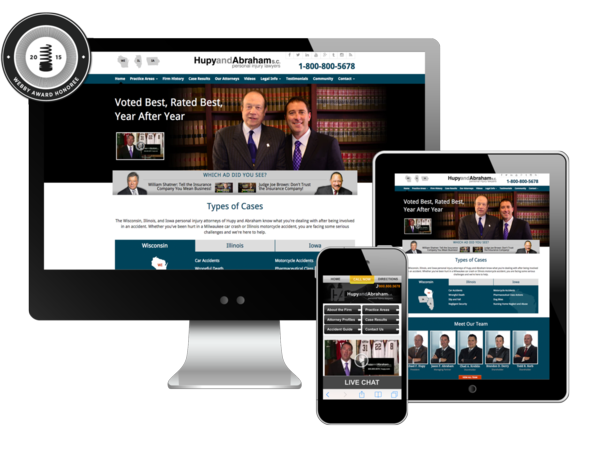 Personal Injury law firm Hupy and Abraham, S.C. has been honored for Best Website: Law at the 19th Annual Webby Awards. The Webby Awards are presented by the International Academy of Digital Arts and Sciences (IADAS), have been acclaimed as the “Internet’s Highest Honor” by the New York Times and is the leading international award honoring excellence on the Internet. The firm, which provides top-notch legal services in a variety of practice areas, including car accidents, motorcycle accidents, pharmaceutical class actions, nursing home negligence and more, has set a high standard for Internet marketing and development of one of the best websites in its industry. In 2014, the firm unveiled a more user-friendly interface to its website for easier navigation. Additionally, the State Bar of Wisconsin has listed the Hupy and Abraham blog as an active presence in the local legal community.